Anthony Franciosa (October 25, 1928 – January 19, 2006), usually billed as Tony Franciosa during the height of his career, was an American film, TV and stage actor. He made several feature films, including A Face in the Crowd (1957) and Career (1959) for which he won the Golden Globe for Best Actor/Drama. In television, along with many minor parts, he played lead roles in five television series: the sitcom Valentine's Day (1964–65), drama The Name of the Game (1968–71), Search (1972–73), Matt Helm (1975) and Finder of Lost Loves (1984). However, he began as a successful stage actor, gaining a Tony Award nomination for the drug-addiction play A Hatful of Rain. Born Anthony George Papaleo to an Italian-American family (his grandparents emigrated from Melfi, Basilicata, in 1890), and raised by his mother and aunt, he adopted his mother's maiden name Franciosa as his professional name. In 1948, Franciosa joined the Cherry Lane Theatre Group off Broadway (at the same time as actress Beatrice Arthur). Within two years, he had been accepted as a member of the Actors Studio, which would prove an invaluable resource going forward but it would be a few years more before Franciosa could make a living from acting. In the meantime, he worked a variety of jobs which included being a waiter, dishwasher, day laborer, and messenger boy. Several years later he garnered rave reviews and a Tony Award nomination for his Broadway performance of the play A Hatful of Rain. When he reprised his role in the film version in 1957, he was nominated for an Academy Award for Best Actor. He followed that with roles in several major films, including A Face in the Crowd (1957) with Andy Griffith and Patricia Neal, The Naked Maja (1958) with Ava Gardner, The Long Hot Summer (also 1958) with Paul Newman and Orson Welles, Career (1959) with Dean Martin and Shirley MacLaine, Period of Adjustment (1962) with Jane Fonda, The Pleasure Seekers (1964) with Ann-Margret and Carol Lynley, Fathom (1967) with Raquel Welch, The Drowning Pool (1975) with Paul Newman and Joanne Woodward, and Rio Conchos with Richard Boone and Stuart Whitman. He also appeared in a prominent co-starring role in the Frank Sinatra film Assault on a Queen (1966) and was later in the 70s film of the Jackie Collins book The World Is Full of Married Men. He guest-starred in the television series The Greatest Show on Earth, Jack Palance's circus drama, which aired on ABC from 1963–1964. That same season, he appeared in the ABC medical drama about psychiatry, Breaking Point. Producer David Dortort was on the verge of casting him as Cameron Mitchell's best friend and brother-in-law, Manolito Montoya, on the western, The High Chaparral, if Henry Darrow did not make it in time. Unfortunately for Franciosa, he lost the part, because Darrow had arrived on the set, right on time, before filming was about to begin, in two weeks. Eager to act in any medium, he became a series lead in the sitcom Valentine's Day and drama TV series The Name of the Game (and its pilot TV-movie Fame Is the Name of the Game), as lead role of charismatic but doggedly determined star reporter Jeff Dillon, alternating the regular lead spot with Gene Barry and Robert Stack. He was fired from the series because of his temper. He had a further alternating lead role, this time alongside Hugh O'Brian and Doug McClure, as agent Nick Bianco in Search, and then on his own in Matt Helm, a spinoff of the spy-spoof films that starred Dean Martin. He also played roles in all-star television miniseries, such as Aspen (1977) and Wheels (1978). In the 1980s, he starred in the Aaron Spelling-produced series Finder of Lost Loves. 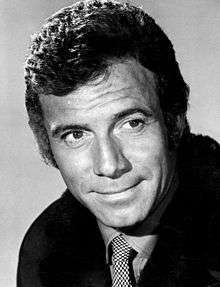 Franciosa also made notable guest star appearances as a villain in the Western series The Virginian (episode "Holocaust," aka "The Shiloh Years") and later The Men from Shiloh, plus was star of the Theatre of Stars episode "A Case of Armed Robbery" convincingly playing a man with feelings of alienation from a society driven to crime. In the 1985 revival of The Twilight Zone, he appeared in the third-season episode "Crazy As a Soup Sandwich," playing a gangster who is revealed to be the ultimate demon. Franciosa's final film was City Hall, a 1996 drama starring Al Pacino and John Cusack, in which he portrayed a New York City crime boss. Billed as "Anthony Franciosa," he won the 1960 Golden Globe Award for Best Actor – Motion Picture Drama for the role "Sam Lawson" in Career (1959), opposite Dean Martin and Shirley MacLaine. He had won the Globe competing with actors Charlton Heston in Ben-Hur, Richard Burton in Look Back in Anger, Fredric March in Middle of the Night and Joseph Schildkraut as Otto Frank in The Diary of Anne Frank. In 1958, Franciosa had been nominated for an Academy Award for his role as Polo Pope in the film version of A Hatful of Rain (1957), opposite Eva Marie Saint and Don Murray as his brother, Johnny, a morphine addict. Franciosa was married four times, and had three children. His first wife, Beatrice Bakalyar, was a writer. They were married from 1952 to 1957. The marriage ended in divorce. His second wife was Oscar-winning actress Shelley Winters; they were married from May 4, 1957 until their divorce in 1960; they had no children. Her death preceded his by five days. His third wife, the former Judith Balaban, is the author of the book The Bridesmaids, about her friend Princess Grace of Monaco, in whose wedding she served as a bridesmaid. This marriage produced Franciosa's only daughter, Nina. His last wife (from November 27, 1970 until his death in 2006) was Rita Theil, by whom he had two sons, Marco and Christopher. Christopher Franciosa is an actor. Marco Franciosa is an organic farmer. Rita, his last wife, when asked about Anthony's hair-trigger temper said, "He was never taught how to control his temper ... I changed him a lot ... We still have good fights once in a while, but I can scream back at him." "It took years of therapy and simply living through things to finally accept and enjoy myself. My wife Rita's influence has been profound in that process. Her family was a product of The Great Disaster — World War II. She emerged from the flames with a remarkable buoyancy. Each day she rises with an optimism, a serenity toward life that is certainly contagious. Does that sound romantic? If so, so be it." During his later years, Franciosa lived in Brentwood, a district in West Los Angeles. On January 19, 2006, Franciosa died at age 77 at UCLA Medical Center in Los Angeles, California after suffering a massive stroke. His death followed that of his ex-wife Shelley Winters by five days (Franciosa suffered the stroke the day Winters died, January 14). He is survived by his wife, Rita, his children, Nina, Christopher, and Marco and his grandchildren, Ruby, Cassius, Alistar, and Rye Franciosa. ↑ Michael A. Lipton: "Back in the Game," People Magazine (March 18, 1996). "By 22, Anthony Franciosa (he had taken his mother's maiden name) was studying at the Actors Studio. At 25, he made his Broadway debut in End as a Man"
↑ People Weekly, March 18, 1996, v.45 n.11 p. 73. Wikimedia Commons has media related to Anthony Franciosa.